Brazilian President discusses possible embassy relocation, says only extreme Arab countries will oppose the move. Brazilian President Jair Bolsonaro said in a speech on Thursday that "the Israelis are the ones who have to decide what is the capital of Israel." He added that “more extreme” Arab countries might oppose the relocation of the Brazilian embassy to Jerusalem, but others would not. 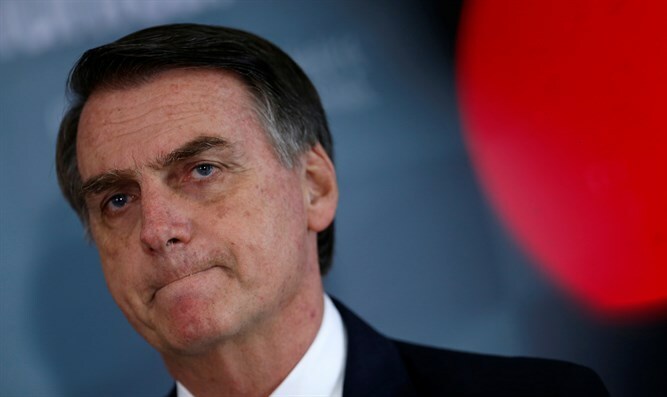 Earlier on Thursday, Bolsonaro’s national security adviser, Retired Army General Augusto Heleno, said that the President wants to move Brazil’s embassy in Israel to Jerusalem, but that logistical considerations were standing in the way, Reuters reported. Heleno did not elaborate but, according to the report, the country’s agriculture sector is opposed to moving the embassy from Tel Aviv and angering Arab nations that buy billions of dollars worth of Brazilian halal meat each year. He added that he did not think there would be problems with Arab nations who have threatened to boycott Brazilian exports if it moves the embassy to Jerusalem, arguing that Brazilian diplomats would work with Middle Eastern trading partners to ease concerns. Prime Minister Binyamin Netanyahu later hailed Bolsonaro's announcement. Arab leaders, however, have condemned the move and have pressured Bolsonaro not to go through with it. Netanyahu, who visited Brazil for Bolsonaro’s inauguration this week, said on Sunday that it is only a matter of time until Brazil moves its embassy to Jerusalem.